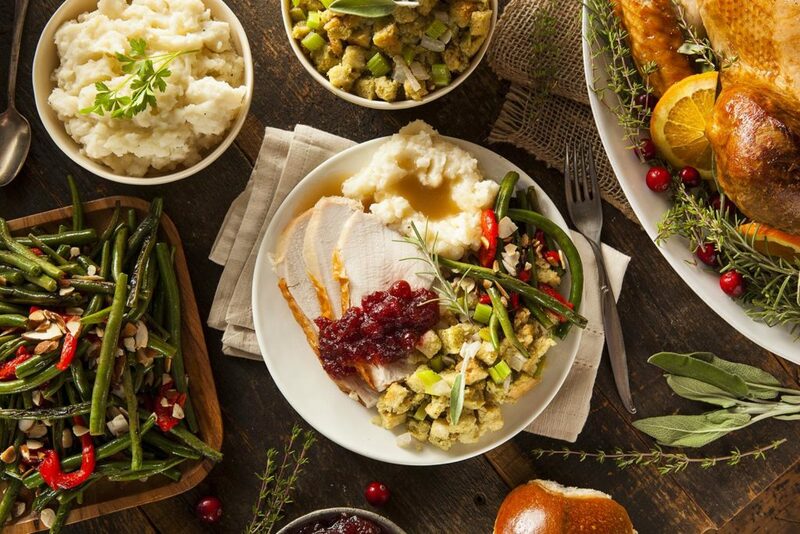 Blog » Battle of the Thanksgiving Leftovers!! Battle of the Thanksgiving Leftovers!! So far in our Thanksgiving-themed series, we’ve talked about how to cook a Thanksgiving turkey, dished about side dishes, and drooled over desserts. Thanksgiving Day will be here before you know it and it’s a day that can be filled with good food, the company of friends and family, and who knows, maybe even some Detroit Lions football. Before we all know it though, the day has come and gone and we’re left we our memories and likely some leftovers…and in some cases, lots of leftovers! This leads us to ask, what can you do with all of those Thanksgiving leftovers? I mean, how many turkey sandwiches can one person really eat?! We put out the call to several of our Chef Instructors here at Dorsey Culinary Academy, and asked them for their re-imagined creations using Thanksgiving leftovers. It’s a little something we like to call, Battle of the Leftovers!! They were then tasked with giving their spin on transforming common Thanksgiving leftovers into a new meal. The chefs were allowed to use additional ingredients (that may be around the house) to craft their culinary creations. The dishes should be something executed with easy to medium difficulty in a relatively short amount of time. We want to know…after reviewing the recipes below, which chef do you think created the most creative meal (and the meal that sounds the tastiest)?? Turkey Pot Pie – One complete meal with leftovers. Heat the butter in a small sauté pan and sauté the mushrooms. Season with salt and pepper. Blanch or steam the potatoes, carrots, onions, and corn separately until tender. Bring the turkey gravy to a simmer. Add the cream and simmer for 5 minutes. Add the turkey, potatoes, green beans and other vegetables to the sauce, season with salt and pepper and ladle into a shallow half-size hotel or other pan. Cover the pan with the biscuit dough. Egg-wash the top of the dough. Bake at 400°F (200°C) until the top is well browned, approximately 15 minutes. Warm leftover mashed potatoes in a sauce pan without adding any additional liquid. Add cumin, coriander, turmeric, garam masala, salt to taste, chili powder, onion, and cilantro to potatoes. Form patties about 1/2 inch (1 1/2 cm) thick using 2 tablespoons (43 g) of potato mixture each. Heat enough oil to cover bottom of skillet over medium heat until hot. In batches, sauté potato cakes until golden brown and crisp on both sides. Drain on paper toweling. Keep warm in low-temperature oven while frying remaining potato cakes. Top with table spoon if cold yogurt and serve with salad. Place all ingredients for vinaigrette in bowl and whisk until well mixed and slightly thickened. Correct seasonings. Mix all salad ingredients in bowl. At serving time, pour vinaigrette over salad, toss gently to coat thoroughly. Serve with freshly fried potato pancake. Whip the eggs in a mixer fitted with the whip attachment until well beaten. Add the sugar, oil and salt and whip for 5 minutes on medium speed. Add the pumpkin purée and mix until combined. Add the dry ingredients and mix until well blended. Pour in the orange juice and mix until smooth. Scale the batter into greased and paper-lined muffin tins or paper baking cups approximately 2/3 full. Using a table spoon measure, scoop the pre-made pumpkin pie, form into a ball, and push into the center of the muffin batter. The batter should completely cover the inserted pie scoop. Bake at 400°F (200°C) until the muffins bounce back when lightly pressed, approximately 18 to 22 minutes. Once cooled, top the muffins with the cream cheese icing. Blend the cream cheese on low speed in the bowl of a mixer fitted with the paddle attachment. Add the powdered sugar in increments stirring well between additions and scraping down the bowl frequently. Add the softened butter and vanilla. Blend on low speed until smooth, scraping down the bowl frequently. *recipes adapted from Pearson Kitchen Manager to accommodate the Thanksgiving Day leftovers. Heat the oil in a medium sauce pan. Add onions and garlic and sauté until translucent. Add all the spices and the ancho chili. Cook until fragrant. Break up the pie and add to pan. Add stock and bring to a boil. Add almonds. Reduce heat and cook for 20-30 minutes. Remove ancho peppers (for a spicier sauce, remove the stem and seeds from the pepper and return to the pot) and puree until smooth. Return to heat and continue simmering until a deep, complex flavor is developed (additional 20-30 minutes). If sauce becomes too thick, add water until desired consistency is reached. Stir in chocolate to melt and season with salt and pepper. Cut the turkey into desired portions size. Coat generously with Pumpkin Pie Mole and heat in 400°F oven until heated through. Mix first 4 ingredients together until a patty can be shaped. Shape patties into desired size and pan fry in canola oil until slightly browned and heated through. Gently fold egg white into casserole being careful not to incorporate any air. Spread mixture thin onto a pre greased baking pan. Bake in a 400°F oven until crispy. Break into pieces. On a warm plate, place a hot potato cake slightly off center. Arrange the heated turkey closest to the presentation side of the plate. Spoon extra mole over the turkey. Top with crispy green bean casserole. Enjoy this unique use of pumpkin pie and leftovers. “When I think about thanksgiving leftovers may things come to mind, soups, stews, sandwiches, and casseroles to name a few. As I thought about things to make with these leftover items, my favorite breakfast meal kept coming to mind, eggs Benedict. So I decided to create a play on the classic with new, leftover flavors involved. This is my take, a green bean casserole bites and turkey Benedict over a pumpkin potato cake. First start with the classic Benedict sauce. Cook egg yolks in a double boiler stirring constantly until the eggs become thick, then add a little white wine, Tabasco sauce, and finally melted butter until the sauce is slightly thinned. Next we need to make our green bean bites. Take the leftover green bean casserole and chop it lightly to create smaller pieces of beans. Then stir in eggs and breadcrumbs and mix well, then roll the large marble size balls of filling in extra breadcrumbs. Pan Fry to a golden brown and reserve. Next up is the pumpkin potato cakes, simply mix together the filling of the pumpkin pie and the left over mashed potatoes together. Then gently mix in eggs, flour, and salt and pepper to taste. Pan fry the cakes until crispy and golden brown. The last step is to heat our leftover turkey and assemble our meal. Over medium heat, sauté the turkey with some carrots, onions, and celery, toss that together with the green bean bites. Spoon the hash over the potato cakes that have had cranberry sauce spread on them. Place an egg cooked to your liking over the top and finish with the hollandaise sauce. The Culinary Arts program at Dorsey Schools is designed to assist students in taking their love for food and transforming it into an exciting new career. Training in the Culinary Arts program at Dorsey takes place in the classroom, in the commercial kitchens (with industry-current equipment) on campus, as well as during the externship (which takes place the final module of training). The Dorsey Schools Culinary Arts program strives to expose students to various facets of the culinary industry including Butchering, Baking & Pastry, Nutrition and Healthy Cooking, International Cuisine, Catering, and more! The Culinary Arts program is offered at the Roseville, MI and Waterford-Pontiac, MI campuses of Dorsey Schools. It’s also worth noting that the Culinary Arts program at Dorsey Schools is programmatically accredited by the American Culinary Federation Education Foundation’s (ACFEF) Accrediting Commission. If you’re interested in pursuing a career in the Culinary Arts, consider the program at Dorsey Schools. You can call us at 888-422-1188 or click here to contact us online! Previous PostDorsey Schools Spotlight: Meet Revah, A Student In Our Electrical Technician Program!